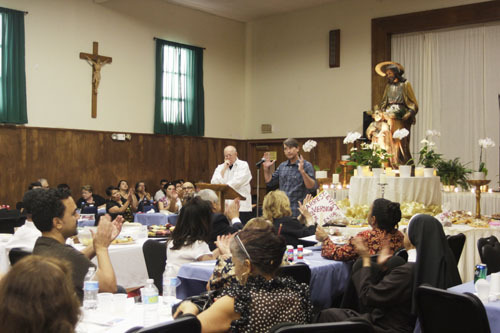 When news broke last summer that a grand jury was investigating Exide Technologies, community activists celebrated with cake and pizza at Resurrection Church in Boyle Heights. Last weekend, following the announcement that the U.S. Attorney had reached an agreement to close down the plant permanently, they were back at the Church, this time celebrating with tequila and champagne. Over 200 people were on hand to exalt the closure of the embattled acid-lead battery recycling plant in nearby Vernon. 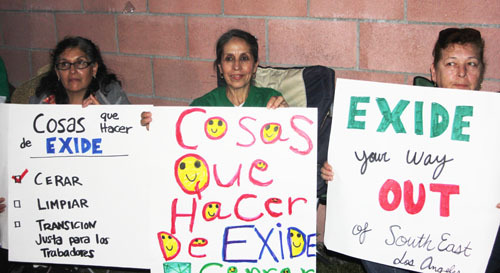 The agreement calls for the immediate, permanent closure of Exide’s plant and for the company to spend millions to clean up the facility and nearby properties polluted by its toxic emissions. In exchange, the company and its executives will avoid criminal prosecution for its admitted decades long illegal handling of hazardous waste. “Let’s continue the struggle, but tonight we celebrate,” Rev. Monsignor John Moretta told the crowd, drawing loud applause. 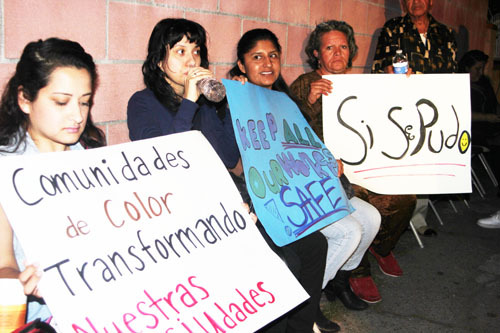 Last Thursday – the day the news broke – the regular bi-weekly meeting of environmental justice advocates East Yard Communities and Communities for a Better Environment to discuss the ongoing struggle with Exide, was replaced with music, hot dogs and dancing. Modesta Carranza hosted the event in East Los Angeles and called the festivity a “celebration among neighbors,” with neighbors coming from Huntington Park, Maywood, Boyle Heights and beyond. “In the long struggle for the civil rights of the Chicano/Latino community, it’s hard getting a victory,” so we have to celebrate them when they come, said Boyle Heights Neighborhood Council President Carlos Montes during the event. Credit for the hard-fought victory belongs to the community, people at both events said. If you live in a low-income, immigrant community it’s harder to get government to listen to you, said East L.A. resident Victoria Zepeda. “It takes many hands to make a masa (dough),” said Moretta before naming all the organizations that helped raise awareness of the environmental injustice. Mark Lopez from East Yard Communities celebrated with his mother and daughter in East L.A. and reflected on how many generations were forced to endure Exide’s toxic emissions before action was finally taken. “I never thought I would see the day,” echoed his mother Elsa Lopez, whose fight to close the plant goes back decades with the Mothers of East L.A. Behind all the celebrations and feelings of victory, however, there remains nagging doubt, state regulators are up to the task of forcing Exide to live up to its agreement with federal authorities. There is also anger that no one will be criminally prosecuted for releasing lead, arsenic and other toxins into the air and groundwater, exposing over 100,000 people to cancer causing levels of toxic chemicals. It’s hard to forget how long it’s taken elected officials and regulators to act, said many of the people involved in the anti-Exide movement. “Nobody believed how bad it was,” said Boyle Heights resident Teresa Marquez. They did not believe this could be going on in a state with so many environmental protection laws, she said. But Marquez never believed claims by Exide and state officials that the company was not a danger to the community. “We knew Exide would lie, but DTSC and AQMD? We wanted to trust them,” she angrily recalls. Terry Cano was not sure how to feel when she heard Exide was being forced to close because she never thought she would live to see the day. “My first reaction was shock, I was happy,” said Cano. But “I really got angry and disappointed” when I heard the terms of the agreement, said the Boyle Heights resident. “They literally got away with murder,” she said in disgust. California’s Department of Toxic Substance Control, DTSC, was not a party to the negotiations between Exide and federal authorities, but has been charged with making sure Exide’s complies with the terms of the deal. The second phase will involve cleaning beyond the facility and into the neighborhoods. DTSC had earlier secured $14 million from Exide for the clean up of 216 potentially contaminated properties, although some of that amount still has to be approved by bankruptcy court later this month. As a result, “[Exide] has a much greater incentive to work with us,” she said. According to Lee, DTSC had already started the process to deny Exide’s application for a permanent permit — the company had been allowed to operate with a temporary one for more than three decades — when federal authorities struck their deal. “[Exide] knew we were going to deny their permit and that they were going to be shut down irrespective of what the USAO was going to do,” Lee said. Herrera says he was surprised that the U.S. Attorney’s office got involved. Many like Herrera are angry DTSC did not act sooner. They are also angry Gov. Jerry Brown last year vetoed Sen. Kevin de Leon’s bill to create stricter oversight of state agencies like DTSC. “Yes Exide is down, but DTSC is now responsible for the mess they allowed here in our communities,” said Lopez. “The state of California needs reform and laws with teeth that will stick,” Marquez said. Leading environmental groups are calling for an overhaul of the state’s regulatory agencies, with some going so far as to demand DTSC be shut down until it can be reorganized. Lee, who has only been in her position for three months and inherited the mess from her predecessors, defends the agency against accusations it has repeatedly failed to take decisive action against Exide. She points out the agency has in recent years collected millions of dollars in fines from Exide, and that’s it’s effort to close the plant was thwarted by the courts. “I have a lot of hope that Barbara [Lee] will turn the agency around,” says Herrera, but “to us, they are still the same agency. Montes worries Exide will just move elsewhere and contaminate another community. “[Exide’s] priority isn’t cleaning up, its making a profit,” he said. The U.S. Attorney said its deal with Exide would allow the company to remain financially solvent so it can pay to clean up the damage it has caused. If they don’t, they will be criminally prosecuted. For now, Boyle Heights resident Ethel Lopez, 60, is relieved that she will be able to breath fresh, clean air. Many residents told EGP they feel they have helped secure a clean, safe environment for future generations. “I’m very happy that this isn’t going to have to be my daughter’s fight,” Mark Lopez said. “You can watch us going forward, we will clean this up,” promised Lee. March 19, 2015 Copyright © 2012 Eastern Group Publications, Inc.